Are you ready for Halloween? Today I have a fun craft to help you get into the spirit of the holiday with the kids; Felt Finger Puppets in Halloween-themed characters! They're easy to make and fun to decorate. I've done a mummy and a couple of creepy-cute monsters. Let your imagination run wild! You can take on making vampires and werewolves with a little creativity. 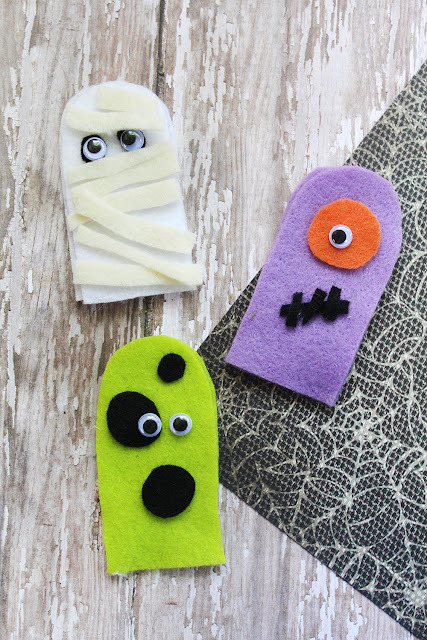 Your kids can use them to put on a Halloween-themed puppet show, or just carry around some spooky friends with them. They can have fun making them, but also fun playing with them afterward, which is why we love this craft. It keeps our little fingers busy! Directions:1. Begin by cutting out the bodies of your puppets. A simple half oval shape will do. 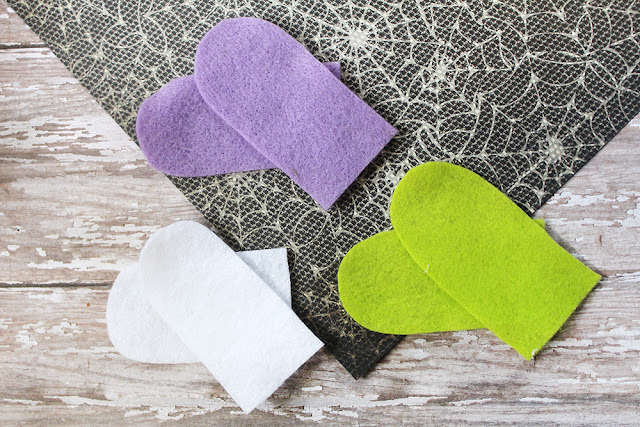 You can create a stencil and trace it onto the felt if you wish for a nice uniform look. Remember to make it large enough that when the sides are glued, it will fit over your or your child's fingertips. 2. Cut out two of the shapes for each puppet. This way the puppet has the front and back side. 3. 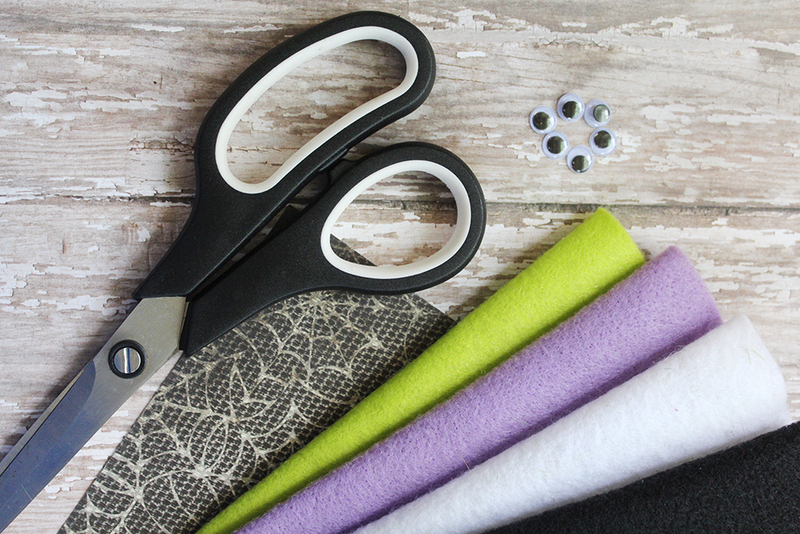 You can now create your embellishments. For the mummy cut out simple strips to use as wrapping, and for the monsters, some various circles and strips for stitches will work great. 4. You can now assemble the bodies of the finger puppets. Add glue along the edge of one half of an oval and place the second piece over it so they match up. DO NOT add any glue along the flat edge as this is where your finger goes in. Press firmly and allow to dry. 5. Assemble the faces. 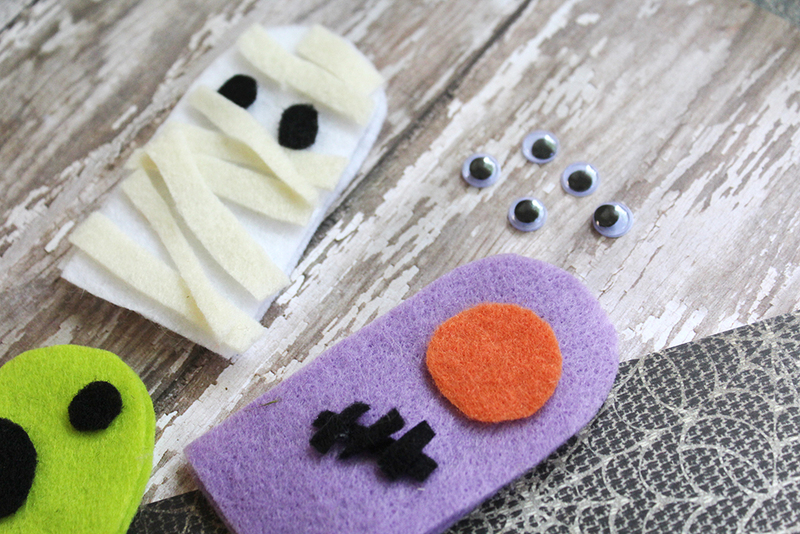 See the photos for simple ways to arrange your shapes and googly eyes to create spooky looks. Allow all pieces to dry well before use. I hope you have fun making and using these fun finger puppets! Are you ready for all things Halloween? 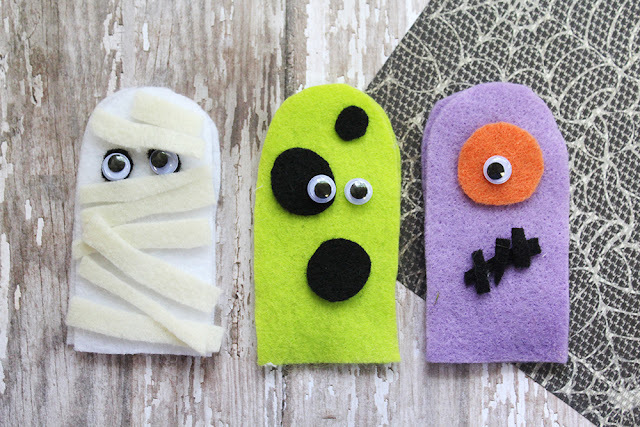 Will you be making these finger puppets with the kids? I love to read your comments!